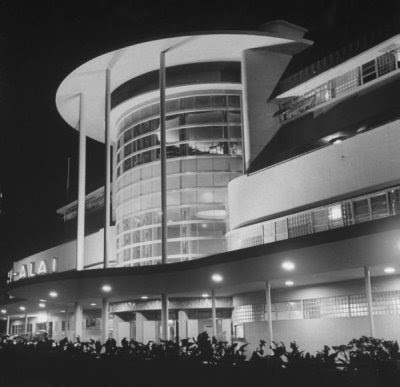 Jai Alai building, an elegant art deco architectural gem, with cylindrical glass front and "Sky Room" emblazoned on the facade, that Tutubi used to see almost everyday whenever he passed by Taft Avenue, near Rizal Park, in Manila when he was a student in the 90's. Designed by architect Welton Becket in the art deco style and completed in 1940, it quickly became the home of the pelota game from Basque and frequented by the rich and famous. The Jai Alai building survived World War II, was renovated and used til the 1980s. 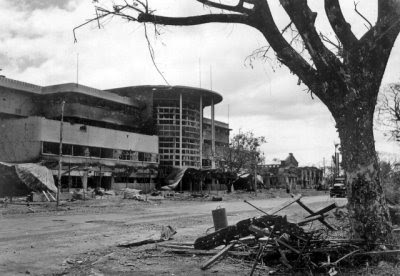 The Jai Alai deteriorated in 1986 when the government sequestered the property and placed it under the jurisdiction of the Presidential Commission on Good Government (PCGG) after the Edsa Revolution that soon became a shelter for squatters. On July 15, 2000, the elegant Jai Alai fronton's demolition began furtively on the orders of Manila mayor Lito Atienza, the heritage-ignorant Manila mayor, to make way for the planned Manila Hall of Justice. Up to this time, the hall of justice was never constructed and the Jai Alai building formed part of Tutubi's reminiscence, even if badly needing renovation during it's last years. It still exuded the charm Tutubi saw though not yet aware of it's heritage and architectural significance. It was the demolition of the Jai Alai building that caught the ire of artists and heritage conservationist in the Philippines. On the other side of the globe, the demolition of New York's Penn Station in October 1963 awakened heritage conservation advocates and were able to save other historical and architecturally-significant buildings in the United States. The same didn't happen in the Philippines. Left and right, save a few, architectural heritage gems were demolished even with the pleas of advocates; the pending Heritage Bill even rots in Congress due to preoccupation with charter change to serve their own ends. One of the latest victories though of heritage conservationists is the recent declaration by the Manila City Council of the Xavier House in Sta. Ana, Manila, near Sta. Ana Church and Plaza Calderon, as a landmark thus sparing the historic building from future demolition. Xavier house was the home of Radyo Bandido setup by well-loved Jesuit priest Fr. James Reuters during the 1986 EDSA "People Power" revolution. If you're a Filipino who doesn't care about old, architecturally and historically significant buildings, who wants 'em "oldies" to give way in the name of progress, progress that can really continue even without erasing the legacy, you're missing the point for it's really part of the nation's culture that needs preservation for posterity and not just an old building. Jai Alai is claimed to be the fastest game in the world due to the velocity of the ball during play. The Jai Alai uses a ball covered with goatskin and caught using a cesta that looks like a basket in the hands of the players. Jai Alai was banned in the Philippines in 1986 due to allegations of game fixing as well as calls from anti-gambling advocates who claim the game encourages betting and gambling. I can't remember this, but I'm sure I have seen it many many times. I used to pass by all the time. sad...i know lots of Pinoys who couldn't care less about our old landmarks, and these same Pinoys would travel abroad and admire beautiful architecture built centuries ago. ironic 'no? and this also reminds me of the paco train station which was half demolished to make way for a mall which was also never constructed. tsk. terrible decision ! Seems like the city government aren't interested in preserving edifices and landmarks with historical significance. They just want to demolish and build period. what a tragedy. I was a sparing partner to Spanish players during the early sixties... I was a gringo (kana) sailor from the base in Cavite. After our practice sessions we would eat a wonderful lunch at the Bayview Hotel and drink large quanities of draft San Miguel beer. As a kid in the 70's, I used to tag along with my father who worked there. His office was on the third floor. We entered through the side, went up these massive concrete stairs that had seen better days pockmarks and all, but solid nonetheless. There was a very big safe he opened every morning in the general cashier's office. Several people can fit in comfortably. He even had his personal ref inside. The main lobby entrance was decorated with reliefs of pelotaris in different throwing and catching stances. The atrium inside the lobby was around four storeys high and used to have (if I remember right) a huge Christmas tree in the center during the holidays. To go up from the lobby you either took the winding stairs or ride the antique elevator that had to have an operator since it did not have buttons but a brass lever to make the elevator go up or down. I remember watching the pelotaris praticing, the distinct sound the ball makes as it hits the wall as well as the funny sound it makes when it goes to the wooden sidelines. It was in the early 80's that I was able to go to the fabled Skyroom and watch a game from the view deck. That was unforgettable. My father gave the best years of his life working there. He would have stayed longer but did not want any part of the game fixing and scams that the later management encouraged. It was a heavy heart that he left what he believed a pure sport and entertainment that gave 'a million thrills to filipinos' that should have been left alone and not corrupted. You could just imagine how he felt when an 'honorable' mayor tore down the historic landmark. My father just shook his head in despair and disbelief. bopols talaga yan si atienza.